The album starts out with a keyboard sound that gets the tempo up immediately. After about a 20 second instrumental intro, White goes into the story of three women, "...red, blonde hair, and brunette..."...Ah, the rough life of a rock super star. The track starts out a little country and ends aggressive and very Nashville, topped with a harmonica. 'Three Women' is sort of a folk tale of a gigalo with girls he sees all over the country, California, Detroit and Nashville. But, as he barks, "...if I open my mouth, well, that'll be three women I lose." True advice from Mr. White. Don't have a big mouth. The title track that has been out for about two months and has created most of the hype for the new album with its shredded sound. 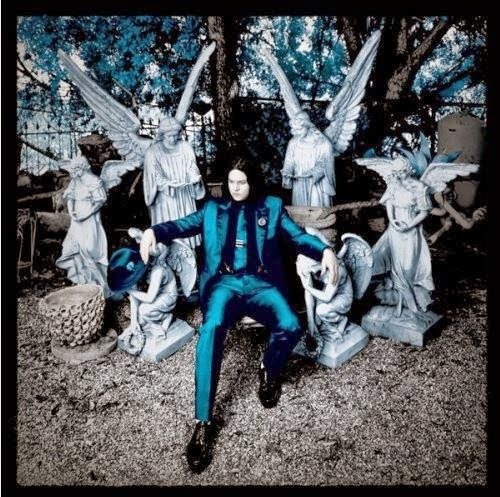 The gritty, funky, scratchy, poppy, rocking Jack White that we've grown to love. White has not missed a beat from 'Blunderbuss' and in fact, if the title track is any indication, he has reached an all new high. The up and down tempo of the track has vibe that will hit every alt radio station this summer and be an instant classic. With his voice having the same type of rhyming and punchy tone as Blunderbuss's 'Freedom at 21', the track is in your face from the start. A friend mentioned to me that it has the feel of Zach De Le Rocha spewing lyrics on an intense Rage' track. I tend to agree as it is Jack White proving that he is rock n' roll's savior in a mixture of EDM and hip-hop crap. He proves his extremes by mixing the rough guitar licks with perfectly placed piano keystrokes. Through interviews over the last couple of weeks White explains the meaning behind 'Lazaretto' as it being something of a Spanish prison. He has said he simple thinks the word lazaretto is a beautiful word. Here is the first taste of folk rock on the album. White duals with the female vocalist throughout the course of the song. He jumps into a story of discovery and speaks about not having sure footing and floating on gigantic lily pads. Trippy dude. He mentioned on a recent NPR interview he felt the song had significant meaning because he wrote the song with the thought of floating on a gigantic lily pad and it so happened the female vocalist/violinist is name Lily. The violin brings a folky element that we first heard on 'Blunderbuss'. One of the slower tracks on the album. White's lyrics talk through his relationship with a girl that he doesn't feel loves him back equally. White goes into it by stating "The last person in the room she hugged...Was the person that loved her the most...Nobody noticed that I was down on the rug...I'm getting better at becoming a ghost" A true struggle with acceptance. White has always had complicated love stories in his lyrics and this follows that theme. This track was more of the folk rock vibe as he continued with the genre. The first 'single' off of his new album, this gritty rocking instrumental track, with hints of organ and the raw garage guitar sound filling the track. The track picks up, slows down and picks up again as we have come to expect from Jack over the course of his content. This was an insane 'teaser' and a great sign for other fantastic tracks to come on the new album back at the beginning of April. This is probably the most country rock song on the album. Its fitting too as the song is the story of what seems to be a hillbilly couple that would rather not be with each other. The couple question each others' love for one another. Man, do you think White has been through some heartbreak in his life? I guess that's what two divorces will do to you and it no wonder why it is a common theme in his lyrics. Piano is prominent in this song going back to the folk rock. The track seems to be about another common theme in his songs and that's being a prisoner of himself and not being able to break from habits. White's lyrics are fairly sad if you look through these tracks. He mentioned he borrowed the words to most of the tracks from poems he wrote when he was 19 years old. I wonder if we are hearing about White's struggles now or from twenty years ago. Regardless, these words come from pain. This track starts again with the piano and has a country feel to it. White sings about being in a town where others are more privileged than he is. He goes into those people who were raised with everything at their disposal and never having to struggle. He mentions how he is "...sick of being told what to do...". At the end he states no one is entitled to anything and ends the old country tale. Probably the funkiest track on the album. This track has grown on me the 5-6 times I have heard it so far. He goes into being a prisoner again and has to have to time clear his had. He perfectly matches the cadence of his lyrics with the multiple instrument backing. This might be the next single. Another folky rock beat. White goes into a story about comparisons that is full of clichés and euphemisms. He belts out "Birds of a feather may lay together...But the uglier one is always under the gun." The beat reminds me of 'Blunderbuss' and is something we have learned to hear from White. Funny story about this song. In that same NPR interview I referenced earlier, White states the birds crowing at the beginning came from an old 'hunting' record that had recordings of birds and was used on portable record player a hunter would take out. The dude is serious about being out there. 'Want and Able' closes the album at a slow folk pace again which is largely what the album consisted of. Overall, I really liked the album. Just like Beck did a few months ago with his recent album, White slowed it down and further expanded his genre. This album has rock, country, folk and even a bit of rock-rap in the title track. White outdid himself again and continues to put out something unique, but still delivering what we might expect from him. This album should play well live, so I'm looking forward to seeing him Saturday at Bonnaroo.